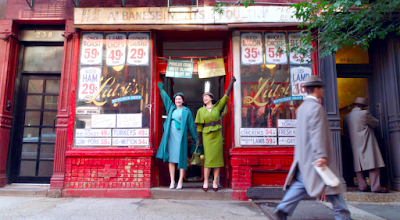 The Amazon series "The Marvelous Mrs. Maisel," set in 1958 NYC, is launching its new season by "creating an immersive Carnegie Deli pop-up experience" at 201 Lafayette St. at Kenmare. According to the pop-up's website, "while it may be 2018 on the outside, it’s 1958 on the inside — the decor, the jukebox, the photobooth, and even the menu." 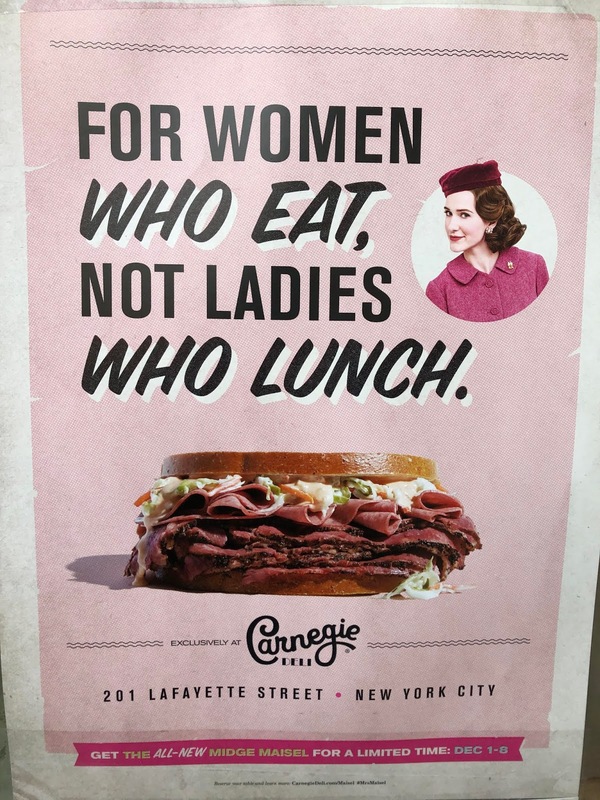 This version of the Carnegie Deli, open from Saturday through Dec. 8, will sell "The Maisel," marble rye with pastrami, salami, coleslaw and "special sauce," for 99 cents. Other menu items include a mini-knish for 75 cents as well as a black and white cookie, cheesecake slice, pickles, Dr. Brown’s Soda, iced tea and coffee — each going for 50 cents. All proceeds will go to the Lower Eastside Girls Club on Avenue D.
As Eater noted at the time, there were numerous setbacks and scandals over the last few years at the deli, "including a wage lawsuit filed by staffers, and the messy divorce of its owner and her husband, who was cheating with a waitress while allegedly helping her open a rogue location of the deli in Thailand." The number of Jewish delis in NYC has greatly diminished in recent years. According to an article published at Haaretz published in January, there were some 1,500 of them in the city in the 1930s; now there are about 20. Perhaps Amazon can recreate other vanishing elements of NYC. Does anyone even watch that show? I guess we can also count the tax breaks that Bezos got having this show produced here in the last 3 years including this one. Here's hoping a protest breaks out in front of it. I bet Katz’s Deli is just thrilled about this. If you could put a price on outrage Bezos would still undercut it. What a time to be alive. @Giovanni - Screw Katz's deli. Let them eat air rights. Katz's Deli should be rewarded for maintaining and keeping open their restaurant through wars, recessions, speculations in the real estate market, both up and down and who stayed in the neighborhood through exodus after exodus of the various ethnic groups that make up the history of the Lower East Side. Regardless of the economy, the crime and the drugs of the neighborhood you could always rely upon the bastion that is Katz's. 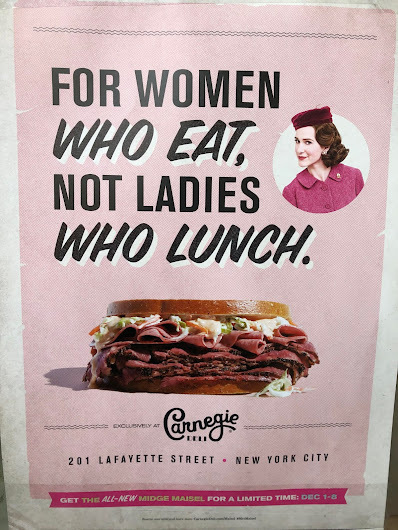 Carnegie Deli brought to you by Amazon? NO THANKS! I'll wait for the eventual Dojo pop-up. Everything that's gone and is missed by people, will eventually return to us as some sort of promotional pop-up store. Meanwhile, the cashless society is being expanded to create the near-ultimate totalitarian experience, with not a squeak from the outraged elite. (the ultimate will include direct brain chipping controlled by 5G networks). Outrageous. Jeff Beelzebub should do something more meaningful to help save prized yet financially weakened NYC businesses and institutions, not week-long "nostalgia" promos for Amazon TV. Better still, the company should turn down the tax breaks in the Queens deal because it will thrive either way. Set a more responsible trend moving forward: No more corporate welfare. Only in NYC kids. Only in NY. As someone who is obsessed with almost everything historical (ESPECIALLY Midcentury), and as much as I love the idea of getting a sandwich, drink and desert for under $2.00, I still dunno if I can support this Disney World crap. Yes it's expensive. Yes it's usually crowded with tourists. But the food is STILL some of the best you can get. And there are clearly very few placed to even get this kind of authentic cuisine anymore. But by some miracle, we somehow still have Katz's, Russ and Daughter and Yonah Schimmel all on the same stretch of Houston. These places are literally time machines, unlike anything that will ever exist naturally again. I can probably count on one hand the rest of the places that exist like this in Manhattan. I will happily pay whatever it costs for the services these places provide, as I believe their historical importance is only outweighed by the quality of the food they still produce. They should be considered nothing less than National treasures, period.